I love the change in the seasons that we enjoyed in the Midwest USA. There were distinctly 4 seasons, winter, spring, summer and autumn. We don’t see all four seasons down here in the Southwest, we definitely have winter, summer and autumn and some years we even enjoy a little bit of spring. One of my favorite things back home was to watch and smell the change in the colors of the tree leaves as they fell to the ground announcing the soon to come winter. There is just something about the sound of those leaves crunching under your feet as you enjoy the autumn outdoors. 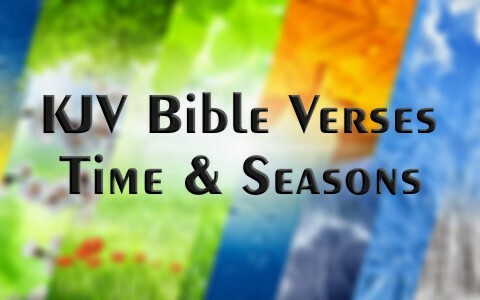 It is our Creator God that gave us this time and seasons and we can see that in the following great KJV Bible verses. Genesis 1:14–18 And God said, Let there be lights in the firmament of the heaven to divide the day from the night; and let them be for signs, and for seasons, and for days, and years: And let them be for lights in the firmament of the heaven to give light upon the earth: and it was so. And God made two great lights; the greater light to rule the day, and the lesser light to rule the night: he made the stars also. And God set them in the firmament of the heaven to give light upon the earth, And to rule over the day and over the night, and to divide the light from the darkness: and God saw that it was good. In this Genesis 1 passage we see the absolute first instance of time and seasons. God spoke it and it happened. This is how the day and night were made as well as how God declared the lights (sun, moon and stars) to be used as the compass to measure the seasons. He said that the greater light (the sun) would rule the day and that the lesser light (the moon and the stars) would rule the night. He said it and it happened and from there on out we have relied upon His perfect plan. Genesis 8:22 – While the earth remaineth, seedtime and harvest, and cold and heat, and summer and winter, and day and night shall not cease. After the great flood the first thing Noah did with his family after leaving the ark was to build an altar to offer a thanksgiving sacrifice to the Lord for all that He had done to protect he and his family from the raging waters that destroyed the earth. He set up an offering of every clean beast and fowl and the Lord smelled the sweet sacrifice. It was then that the Lord promised to never destroy the earth in such a way again (Gen 8:20-21). He declared that the time and seasons should remain so long as the earth remained. Psalm 1 is a picture of the man that walks with the Lord. He is careful whom he chooses to spend his time with. He stays away from those that are full of contempt and disrespect (scornful). Instead he spends his time in the Word and purposes to live a life that is pleasing to the Lord. The Psalmist says that this just and righteous man is as a fruitful tree, it is properly watered (daily in the Word) and therefore produces good fruit at the proper time (season). The Lord blesses him with a prosperous life. Your time on earth matters. Psalms 104:19 – He appointed the moon for seasons: the sun knoweth his going down. This Psalm is a reminder of our Great God. Earlier in the chapter the Psalmist says “Who laid the foundations of the earth, that it should not be removed for ever.” (Ps 104:4). The glory of the Lord is painted as a masterpiece in this Psalm. Take some time to read the entire Psalm 104 and then Praise the Lord of Creation! Ecclesiastes 3 is perhaps the most popular chapter in the Bible to reaffirm that God had a plan when He created the earth and its inhabitants. Have you considered that He hath made everything beautiful IN HIS TIME? This means that time is in His hands and to fully understand the beginning to the end is not something that we should be spending too much time on. Trust the He knows the right time and when He gives you a glimpse of His plans for you, hop to it! I love how the great prophet Isaiah compares the rain with the Word. Water comes down from heaven and does what God intended … it nourishes the seeds to grow into flowers, trees, fruit and vegetables. It does not return to heaven, instead the plants use it up. God’s words should be the same, they should be taken to heart and nourish your soul so that you may grow in the nurture and admonition of the Lord (which is what the Lord pleases). This is the foundation of Biblical parenting. We see that the parents and primarily the father is given the responsibility to raise children in such a way (Deut 6:4-9, Eph 6:4; Col 3:21). Have you considered this? Chapter 1 of the Acts of the Apostles is a wonderful reminder that we just don’t need to know everything and indeed that sometimes we misinterpret things. What I mean is that in this chapter of the Acts. This account happened after the resurrection of Jesus at one of the times that he appeared to the Apostles. They were so thrilled to see Him and were anxious to see what was to happen next. You see the Apostles did not know that this was not the time yet that Jesus was returning to restore the kingdom. They did not know that there was still to be an entire church age (the age in which we now live). But they wanted to know and that is when Jesus gently reminded them that not only was it not necessary for them to know, but that they still had some work to do before the next age (Acts 1:8). Time and seasons are in God’s hands, we just need to trust that He knows when and what is best. Galatians 6:7–10 Be not deceived; God is not mocked: for whatsoever a man soweth, that shall he also reap. For he that soweth to his flesh shall of the flesh reap corruption; but he that soweth to the Spirit shall of the Spirit reap life everlasting. And let us not be weary in well doing: for in due season we shall reap, if we faint not. As we have therefore opportunity, let us do good unto all men, especially unto them who are of the household of faith. Remember that Ecclesiastes 3:1 verse? “To everything there is a season”. We reap what we sow. We have a limited time on this earth and we are continually encouraged to use that time for good. To use that time to share the good news that we know about our Savior Jesus. To use that time to bring more into the Kingdom. But let’s not forget that telling people about Jesus and what He did for them personally is not the end all. We must also use our time to minister (disciple) those that are already our brothers and sisters in Christ. God gives us the energy and knowledge to do everything He asks us to do. Keep on serving, your reward is out of this world! 1 Thessalonians 5:1 – But of the times and the seasons, brethren, ye have no need that I write unto you. In this letter from Paul to the church at Thessalonica, he reminds them that the Lord is coming soon. He had just finished encouraging them that their brothers and sisters that had died and gone on before them would be reunited with them when the Lord returns. In this chapter 5 he goes on to explain how the Lord would return “as a thief in the night” (1 Thess 5:2). He was basically telling them that they should be ready always for His return and that the need to know when He was to return was not necessary because there was plenty of work to be done while they waited. The Apostle Paul’s instructions to us in order to “understand” the Word of God is . . .
Rightly Divide means to “divide” Israel’s prophecy program from the Body of Christ’s mystery program given to the Apostle of the Gentiles, the Apostle Paul! That is the “only” way to understand your Bible, Rightly Divide! Hello Ann and thank you for your comment. I disagree about the context of Paul’s writing to Timothy is about Israel’s prophecy. Paul deals with that in Romans, because Paul’s point after and before 2 Tim 2:15 and which shows the context in which he is writing, is to work hard at discerning and teaching the Word of God. Your proposition about this being a dividing of Israel’s prophecy totally misses the context, and leads to what Paul wrote in the very next sentence, we are to “avoid irreverent babble, for it will lead people into more and more ungodliness” (2 Tim 2:16), and prophecy is not to be our focus…Jesus Christ is our focus and whoever repents and believes will be saved, and that’s no mystery! So, although I appreciate your comments, you’ve taken a text to make it say something else and created a false pretext. The Greek word for “dividing” is orthotomeō and it means “accurately handling” and not dividing prophecy or the Old Testament from the New. Next post: What Is The Difference Between Peace With God And The Peace Of God?